President Barack Obama took pride in presiding over the nation's "lowest unemployment rate in over five years" during his State of the Union address on Tuesday. But while this statement is true -- the jobless rate dropped to 6.7 percent in December -- it's not exactly something to write home about. That's because a large part of the most recent decline in December was the result of 347,000 people giving up the search for work entirely and dropping out of the labor force. Such a decision helps the unemployment rate look better on paper, since it pushes those people out of the unemployment picture altogether. But in reality, it is not a great sign for the millions struggling to find work. 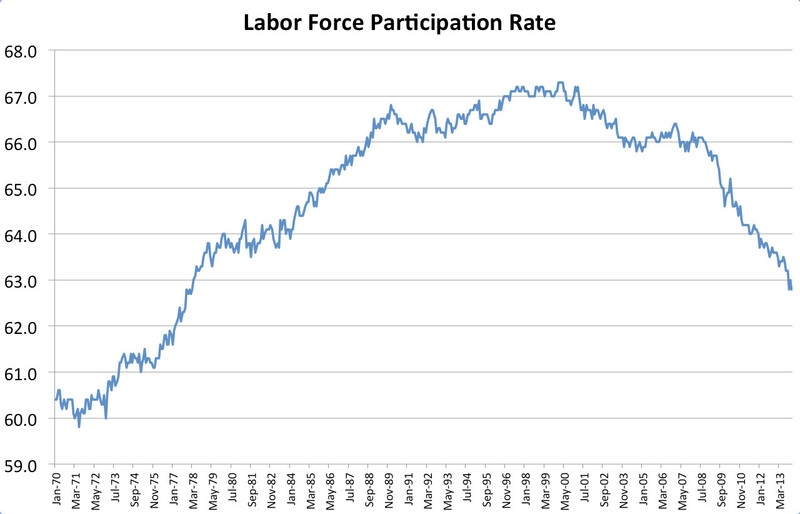 Some of the drop in the labor force participation rate has to do with Baby Boomers retiring, but it doesn't explain the entire drop. Some of the decline, however, can be explained by the share of young people working or looking for work dropping to an all-time low of 54 percent in August 2012, according to a December 2013 paper from the Federal Reserve Bank of Boston. Old-fashioned job creation does account for some of the drop in the unemployment rate, but many of those jobs aren't great. In fact, 75 percent of the jobs created roughly midway through 2013 were part-time, and half of the jobs created in the past three years have been of the low-wage variety.